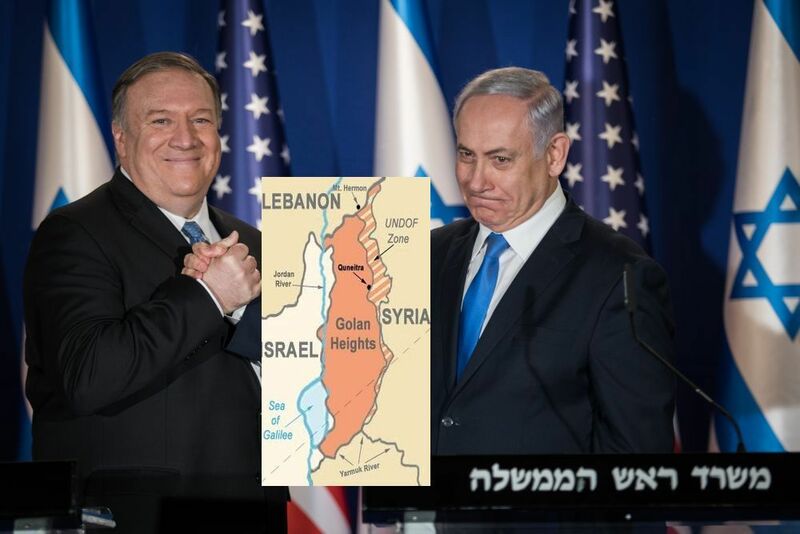 US President Donald Trump’s declared recognition of Israeli sovereignty over the Golan on Thursday, March 21, had a time-sensitive object, unconnected to the Israeli election or Binyamin Netanyahu’s run for reelection, as his rivals contended. DEBKAfile’s military and intelligence sources reveal that it was an arrow aimed by the US president at Iran, Syria, Iraq and Hizballah, and the machinations plotted at Syrian President Bashar Assad’s meeting with Iran’s supreme leader ayatollah Ali Khameini on Feb. 25. Present at their meeting, our sources reveal, were two figures, Al Qods chief Qasem Soleimani, supreme commander of Iran’s Mid East fronts, and, for the first time, a high-ranking Hizballah military official, who is a senior strategic adviser to Hassan Nasrallah. In answer to a question put to him in an Israel TV interview on Thursday, visiting Secretary of State Mike Pompeo pointed out that Qassem Soleimani doesn’t’ consider elections in Israel when he acts day by day against the US and Israel. Pompeo was referring that that groundbreaking conversation in Khamenei’s office on Feb. 25. The presence of a highly representative Hizballah official at that meeting, alongside Assad and Soleimani, signified Tehran’s decision to treat Syria and Lebanon as a single political and military entity. US recognition of Israeli sovereignty in the Golan, though important, does not mark the end of the struggle for this strategic plateau; just the beginning. This entry was posted on March 22, 2019 at 8:21 AM and is filed under Uncategorized. You can subscribe via RSS 2.0 feed to this post's comments. You can skip to the end and leave a response. Pinging is currently not allowed. That’s filling the prophesy. (Its d will of God not ). That’s fulfilling d promised of Al-God that d Holy Land is an Eternal WILL to Pass It Down To All d House Of Jacob.